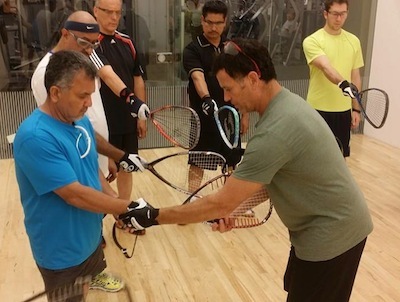 Cliff has a wealth of knowledge about racquetball. We all know that he has mastered everything from the fundamental mechanics to the advanced strategies of the game. That’s why he is increasingly sought after as a coach by some of today’s top professionals and up-and-coming amateurs. What’s less well known is that Cliff coaches amateur players too — amateur players of all levels…and that means you! Easily the best bang for your buck! Work with Cliff to develop a custom coaching package that is personalized to your skill level, schedule, and pocketbook. All custom coaching packages include full access to the instructional video archive on cliffswain.com. Nowhere near Minneapolis or any of the other cities on Cliff’s travel itinerary? No problem! Cliff coaches players from across the globe via video analysis. Learn more about Cliff’s coaching process via video on the Video Coaching page. Cliff travels frequently, and often conducts clinics or group lessons while he’s on the road. Gather enough players and he’ll even come to you. Check the Find Cliff page to see Cliff’s current travel and event schedule. Cliff coaches players at a number of Lifetime Fitness locations in and around Minneapolis. If you live in or will be traveling to that area, feel free to schedule a lesson — or multiple lessons — with him. Book your coaching session right online from the Find Cliff page. Because Cliff gives an unprecedented amount of attention to his site members, you can gain recurrent access to one or more of the above coaching opportunities just by opting for an advanced site membership. Check the Join page to see which level membership is right for you.